Rare Diseases Are More Common Than You Thought - Celebrate Rare Disease Day! Hey guys! Me again. I know it’s been awhile, but I’m back with a new blog for all our wonderful readers. Today I’m going to talk about a subject that is near and dear to heart because I am a member of this community. So without keeping you guys all biting your nails in suspense, today we’re going to talk about RARE DISEASES in honor of RARE DISEASE DAY! There is a saying in the medical community, and a rule by which most doctors live, and it goes like this: “If you hear hoof beats, think horses not zebras.” This is what is known as Occam’s Razor. Occam’s Razor is a theory that basically states that the simplest answer is usually the correct one. The majority of the time, this is not only a logical rule to live by but also a practical and responsible one. If my box of Girl Scout cookies suddenly disappears, it was probably my husband, not a thief that broke in and stole only a box of Thin Mints. This way of thinking helps doctors make healthcare decisions. Rather than exposing a patient to painful and invasive diagnostic tests that are likely unnecessary, they look at the most probable source of the issue and limit their testing to that, saving the patient both time and money. Makes sense, right? The problem is that every now and then, those hoof beats are actually made by a zebra instead of a horse. For those patients, Occam’s Razor is a hindrance to their diagnosis and treatment. This age-old saying was the source of inspiration for the rare disease awareness ribbon. Rare disease patients have affectionately adopted and appropriated zebra stripes to represent their cause. Talking about rare diseases is so important for so many reasons. For starters, rare diseases get the least attention… from everyone, including the medical community and drug manufacturers. It’s not that people actively ignore rare diseases, it’s just that most people have either never heard of the conditions, or don’t understand them. Even most doctors do not usually see cases of even the more common rare diseases. A physician may go their entire career having never seen or heard of some of the diseases classified as rare diseases. This is especially problematic when trying to gain visibility in the rare disease community. It can be very difficult to raise awareness and raise money to support a cause that nobody has ever heard of. As you can imagine, it is hard to find support for a disease that has no celebrity spokesperson and a very small market for drug manufacturers. Not to mention that most people have never and will never be personally affected by it. This sadly leaves many patients with rare diseases in a difficult position. Not only is it difficult to discover the correct diagnosis, but even with the diagnosis treatment options can be limited because of the lack of research and development invested into creating drugs to treat the disease. After you have overcome all of those issues, patients can still suffer because of the lack of experience their doctor has in treating that condition. There are so many obstacles like the ones described that rare disease patients face in their personal health journey. So what is a rare disease, and what’s the deal with rare disease day? I’m glad you asked. Let me break it down for you. First off, let’s talk about what rare diseases are. Obviously, they are diseases that are rare. I know you didn’t need me to figure that out. But what are the qualifications for a rare disease? In the United States, a rare disease is considered any disease that affects less than 200,000 people. That sounds like a lot, but when you consider the fact that there are over 325 million people in the U.S., it really isn’t very many at all. There are somewhere around 7,000 rare diseases. With over 7,000 different kinds of rare diseases, it’s no wonder that it’s so hard for people to get their diagnosis. Can you imagine having to memorize 7,000 different rare diseases in med school that you were likely to never encounter? That would be nuts. Nobody would ever get through med school. You can find our extensive list of Rare Diseases and Genetic Disorders HERE. Many rare diseases are also considered genetic diseases. This has created a great deal of confusion when it comes to the appropriate awareness ribbon color. Should you pick the zebra awareness ribbon for rare diseases or the blue jeans awareness ribbon for genetic diseases? This comes up a lot. The truth is that you can use whichever awareness ribbon you prefer, but if you’d like to find the awareness ribbon category your disease falls under CLICK HERE. Around 80% of rare diseases are genetic. Some rare diseases have organizations that have been able to raise enough awareness to be more visible than others. These diseases typically have their own special awareness ribbon outside of the zebra awareness ribbon. They have become the bigger fish in the small pond (assuming 7,000 fish can be considered a small pond. To be honest, I’m not really sure about the average number of fish in different sized ponds, so please forgive me if I’m wrong and focus on the metaphor.) Personalized Cause is currently working on the most extensive list ever of all diseases and the corresponding awareness ribbon colors for that cause. You can find the Rare Disease Master List HERE. I bring this up for a couple reasons. Reason One: Raising awareness for each of these diseases is crucial in being able to treat and potentially cure them. It is also likely that a lot of these diseases could have shared treatments, and understanding one may lead to a breakthrough in another. It’s a “one for all, and all for one” situation. Reason Two: An awareness ribbon is a surprisingly powerful way to do that. You’d be surprised how many communities have been educated by one person with a ribbon who’s willing to become an advocate. On that same note, people tend to really empathize with a cause when they can put a name or face to it. People are generally good. They want to help. But it’s hard to become invested in a cause that you don’t understand when you can’t imagine the people affected by it. Personalized awareness ribbons are a great way to overcome that. 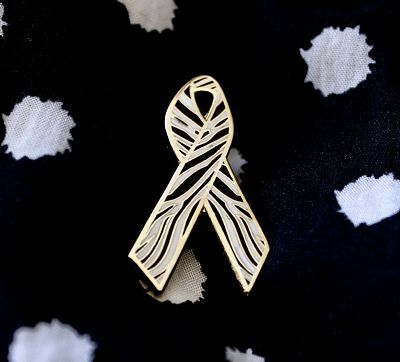 CLICK HERE to see our personalized awareness ribbon "Pin-stagram" gallery. Another way the rare disease community raises awareness is with Rare Disease Day. Rare Disease Day is held annually on February 28. Everyone under the rare disease umbrella comes together to raise awareness, share their stories and wisdom, tips and tricks, and raise money for research and development to advance treatment options for patients. Fun fact about Rare Disease Day: As I mentioned earlier, Rare Disease Day is held every year on February 28th. February 28th was chosen for a very specific reason. February 28th is the last day of February… most of the time. The first ever Rare Disease Day was held in 2008 on February 29th, also known as leap day. They held Rare Disease Day on a day that only comes around every 4 years, in other words a rare day. Since then, Rare Disease Day has been celebrated on the last day of February, which is usually the 28th. The next Rare Disease Day to take place on February 29th will be in 2020. Mark your calendars! Rare Disease Day was created by EURODIS and began in Europe. The United States joined EURODIS in celebrating Rare Disease Day the following year. It has since become a worldwide event with over 90 countries participating. Every year Rare Disease Day events and media reach hundreds of thousands of people, which is a major win in the battle to raise awareness. There are lots of things you can do to participate in Rare Disease Day. Patients and individuals can sign up to host an event to raise awareness or a fundraiser. Remember the ice bucket challenge? Well, Rare Disease Day has a similar viral campaign. People participating in Rare Disease Day paint their faces and post photos of themselves on their social media accounts, using the hashtags #RareDiseaseDay and #ShowYourRare. This face paint social media campaign is a way to show support, raise awareness, and share your story. You can also upload your photo directly to their website, which is a really cool way to share your health journey with others who may find similarities and hope in your experience. Click here to visit rarediseaseday.org. Raise Awareness for Rare Diseases - Be an Advocate! Sharing your story can have a huge impact on the people who identify with your story. When I was young, somebody told me that I should be open about my health and my journey because you never know how much someone may need to hear what you have to say. It always stuck with me. As I got older, I realized how true it was. There have been a handful of moments in my life when somebody said something that resonated so deeply within me that it actually changed my perspective and my life. They weren’t even anything particularly insightful. They just happened to be what I needed to hear at that moment to feel validated and inspired. Becoming an advocate is making the decision to put yourself out there in hopes that you may help others. Being an advocate can be on a personal level, by educating those around you, or on a public level, by sharing your story with the world. There is no wrong way to advocate for yourself and others. I encourage everyone on a personal health journey to share your story. The benefits are far-reaching, for you and for people you may not even know. Nothing will make you feel more supported, reassured, and understood than talking to a community of people who have dealt with something similar. And, like I said, you never know how your words may impact someone else. On that note, I’m going to wrap up today’s blog. I’d like to leave you with a quote that I stumbled across on the Global Genes website, which is an organization for genetic diseases, many of which are rare diseases.